A series of coins have been issued from five British territories and dependencies which pay tribute to the 60th anniversary of the Queen’s Coronation, as well as a lifetime of service to the Commonwealth of Her Majesty and the Duke of Edinburgh. Issued by the Treasuries / Governments of Ascension, British Indian Ocean Territory, The Falkland Islands, Isle of Man, and South Georgia & South Sandwich Islands, the crown coins together are part of an overall greater series which honors the six decades of the of the Queen’s reign and her consort, the couple together have served the British nation, commonwealth and territories longer than any other British sovereign and spouse in history. The coins, five in all are produced by the Pobjoy Mint UK, and include various designs / scenes which represent specific aspects of their lives together. The first coin (British Indian Ocean Territory) includes a depiction of Westminster Cathedral, scene of both the wedding of the then-Princess Elizabeth and the Duke of Edinburgh in November 1947 as well as the place where the Queen herself was crowned on the 2nd June 1953. The second coin (Ascension) features an image of St. Edward’s Crown – which is used during the actual crowning during the coronation. The crown is surrounded by elements of a Rose for England, a Leek for Wales, a Thistle for Scotland and a Shamrock for Ireland. 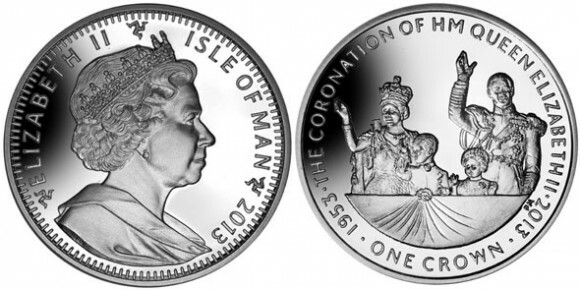 The third coin (Falkland Islands) features a central front-facing image of a young Queen as she was portrayed in 1953 surrounded by a garland of acorns and diamonds. The fourth coin (Isle of Man) re-creates the very scene in which the Queen along with her husband and two children appeared on the balcony of Buckingham Palace after the coronation – this is an image which was reproduced around the world and continues to be referred to especially on anniversaries pertinent to the Queen’s accession anniversaries. 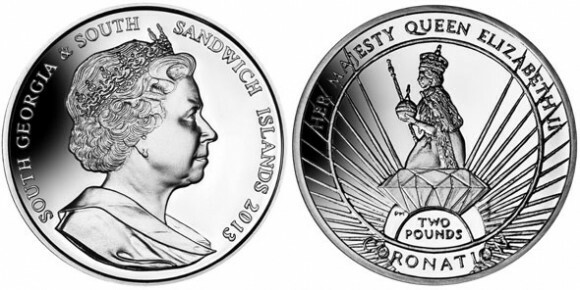 The fifth and final coin (South Georgia & South Sandwich Islands) shows a more symbolic design of that of the Queen as she appeared in 1953 holding the orb and sceptre with the shape of a faceted diamond just in the forefront and rays of light in the foreground. All coins in the series include a fine effigy of Her Majesty Queen Elizabeth II by Ian Rank-Broadley FRBS which is seen on the obverse. All five coins are issued in two versions, a proof silver and a Brilliant Uncirculated cupro-nickel example although the Silver versions have been supplied on an exclusive basis. For more information on these and other coins offered by the Government of the Falkland Islands, please visit the website of the Pobjoy Mint at: http://www.pobjoy.com/ukworld/section.php/815/0 Information offered in English, international orders fulfilled.